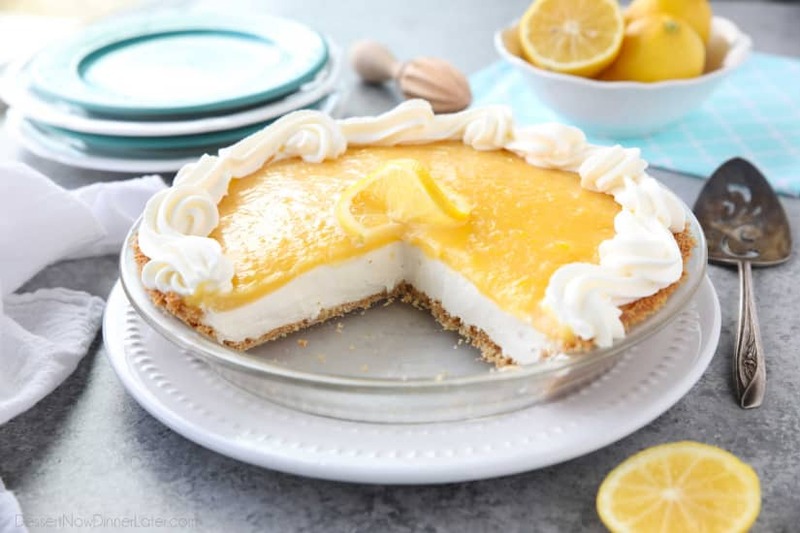 Lemon Cream Cheese Pie - Dessert Now, Dinner Later! 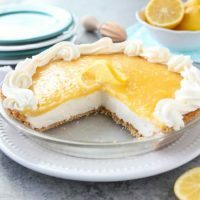 Lemon Cream Cheese Pie has layers of no-bake cheesecake and an easy microwave lemon curd inside of a vanilla wafer crust. It’s the perfect combination of sweet and tart. 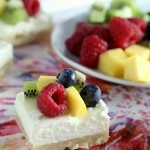 A great dessert for spring, Easter, or summer! 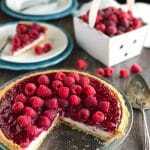 A few months ago I made a Raspberry Cream Pie, which is just like this Lemon Cream Cheese Pie, but with a raspberry filling on top. We loved it so much! 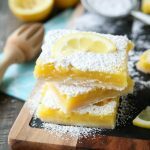 I knew it would also be great with lemon curd on top, and boy was I right! A vanilla wafer crust is filled with no-bake cheesecake, and an easy microwave lemon curd. 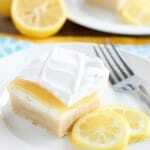 The Lemon Cream Cheese Pie is chilled and then topped with lightly sweetened whipped cream. The flavors are perfect for spring or summer. Or anytime, if you’re a lemon lover! 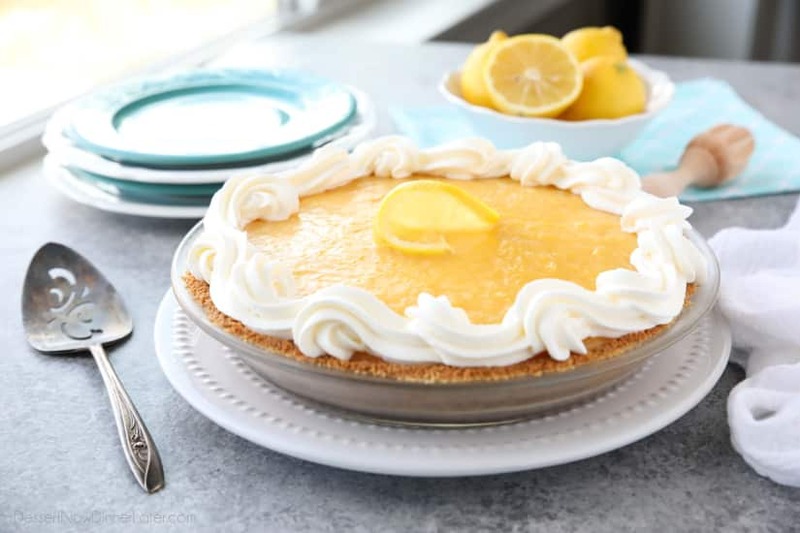 Apparently Marie Callender’s has a Lemon Cream Cheese Pie like this. It’s made with a graham cracker crust, which would also be great. I chose to use vanilla wafers for a simple, lightly sweet crust. CAN VANILLA WAFER CRUST BE MADE AHEAD OF TIME? Yes! Just like a graham cracker crust, you can bake a vanilla wafer crust a day or two ahead of time. Bake the crust, let it cool completely, then keep it covered with plastic wrap for freshness. 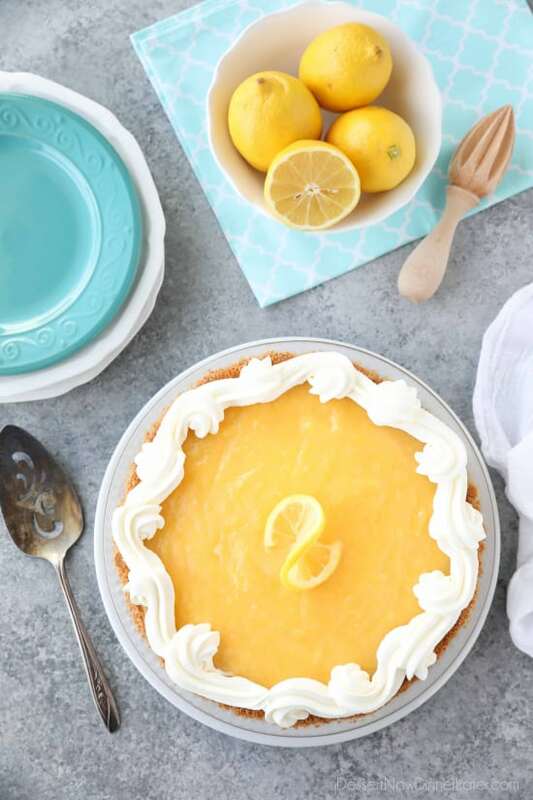 This lemon cream cheese pie needs to chill sufficiently to firm up, so making the whole pie (not just the crust) a day or two ahead would be just fine. You’re going to love this bright and creamy citrus dessert! It’s a great one for spring, Easter, or summer! 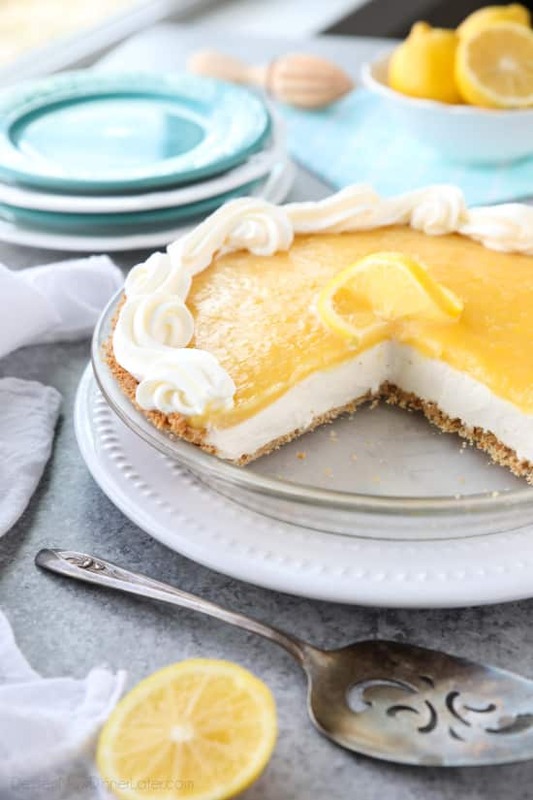 Lemon Cream Cheese Pie has layers of no-bake cheesecake & an easy microwave lemon curd inside of a vanilla wafer crust, topped with sweetened whipped cream. CRUST: Preheat oven to 350˚F. Combine the wafer crumbs, sugar, and melted butter in a 9-inch pie dish. Press onto the bottom and up the sides of the dish. Bake for 8-10 minutes, until lightly brown. Cool completely. LEMON CURD: In a large microwave-safe bowl, whisk together the sugar and cornstarch. Add the lemon zest, lemon juice, and egg yolks. Whisk together. Cut butter into cubes and add to mixture. Microwave on full power for one minute intervals. Whisking after each minute, for 3-5 minutes total, until the curd coats the back of a spoon. (Do NOT overheat.) Remove from microwave, push through a fine mesh sieve into clean bowl or container. Cool to room temperature. CREAM CHEESE FILLING: In a large bowl with a hand mixer, beat the cream cheese, powdered sugar, and vanilla until light and fluffy. WHIPPED CREAM: In the bowl of a stand mixer fitted with the whisk attachment, whip the heavy cream — adding the powdered sugar slowly. Whip until stiff peaks. Store half of the whipped cream in a container with a lid in the refrigerator. Fold the other half of the whipped cream into the cream cheese filling. Spread into the cooled crust. Dollop the cooled lemon curd over the cream cheese filling and spread evenly with a spatula. Cover lightly with plastic wrap and REFRIGERATE for 4 hours to overnight. Top with the remaining whipped cream before serving. Keep leftovers covered in the refrigerator. If you’d rather cook the lemon curd on the stovetop, use the instructions here.